Palmwag Campsite is about 80km west of Kamanjab, a useful stopover when heading further north into Kunene. It’s an oasis of makalani palms in a dry, rocky landscape. Campsites are on sand, each with its own power point, braai, tap and sink with cold water and drying grid or work top. The ablutions are good, with hot water showers and flush toilets. Don’t miss a visit to the poolside bar for a light meal and cold beer. 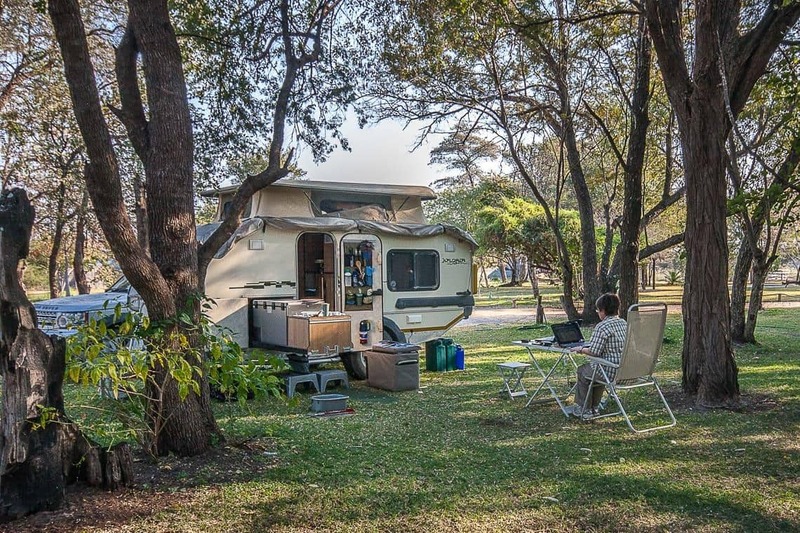 Olifantsrus Campsite is about 150km west of Andersson Gate in Etosha National Park [also accessible from Galton Gate]. 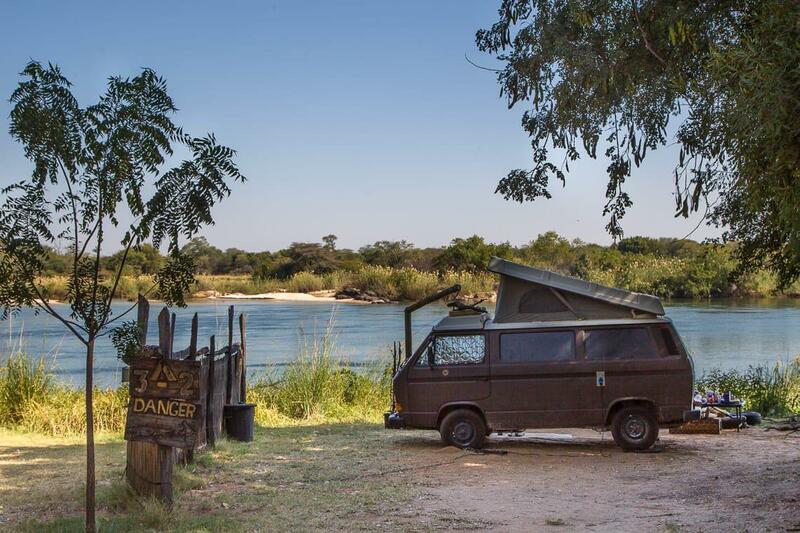 Laid out on reddish sand scattered with mopane trees, each site has a braai and tap nearby. Not all sites have power points, so specify your needs when you book. The communal showers and kitchen are modern and clean, and there’s a small kiosk selling cold drinks and light meals. Although the camp is fenced for safety, there’s a feeling of being close to nature. 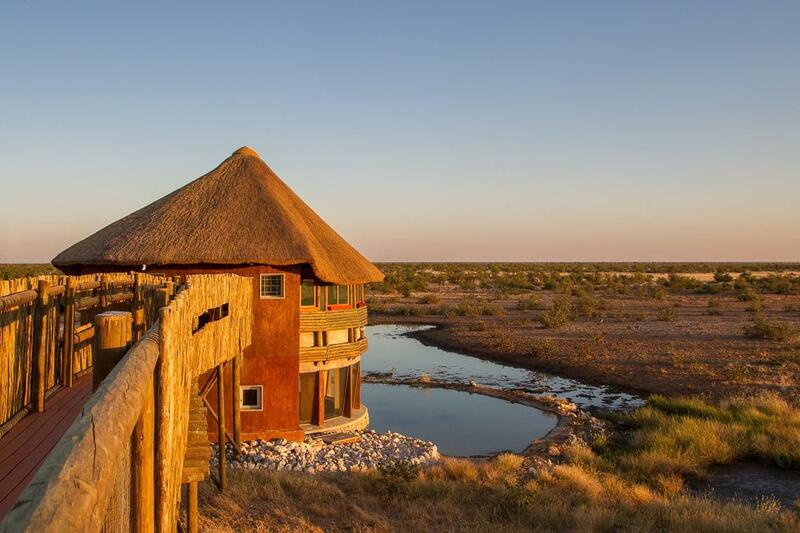 Don’t miss the two-level hide jutting out over a manmade waterhole where you might see elephant, rhino, lion, hyena and plains game. Etosha Safari Camp Campsite 10km south of Etosha’s Andersson Gate is a peaceful alternative to Okaukuejo, close enough to visit Etosha waterholes like Okaukuejo and Nebrownii. Green grass and shade trees are a welcome change from the dry dust of many Namibian campsites. Kitchens and ablutions with hot water showers aren’t fancy but they’re clean. There are taps and power points at the sites, with recycling bins nearby. Campers may use the swimming pool at the lodge. Don’t miss having an ice-cold beer at the funky shebeen-style bar. Nunda’s campsite near Divundu in the Kavango/Zambezi region of northeastern Namibia has sandy sites next to the river, or sites a little further back with green grass and shade trees. Reed screens provide privacy and you get a power point, built-in braai, tap and bin. Ablutions are simple but clean, with hot water coming from a donkey boiler. Enjoy the lodge’s pool and gardens, a cold drink or meal on the wooden deck. Don’t miss seeing the Kavango River turn golden orange from the reflection of the sky just after sunset. At Camp Kwando near Kongola in northeastern Zambezi, green grass and shady knob-thorn, apple-leaf and camel thorn trees make for chilled camping. There are braais, excellent ablutions with hot showers and a swimming pool with shady gazebo. We camped near the pool and plugged into a power point there. Power is from a generator so it’s only on for four hours in the morning and another four hours from 18:00. Don’t miss having a drink at the lodge’s attractive bar and wooden deck along the river. Ngepi Camp, 14km from Divundu in the Zambezi region, is quirky with an oddball sense of humour. Each site has a power point, tap, braai, patch of green grass and some shade. 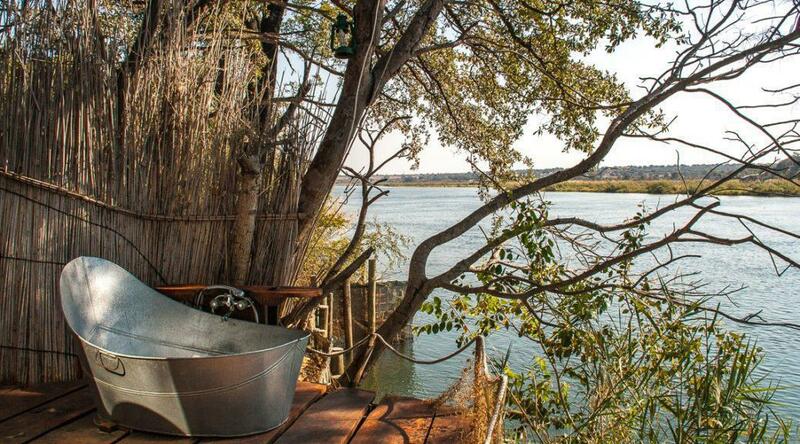 At the river-view sites you can go to sleep listening to the sound of hippos. Overlanders have a separate section of the campsite so they don’t swamp small parties. 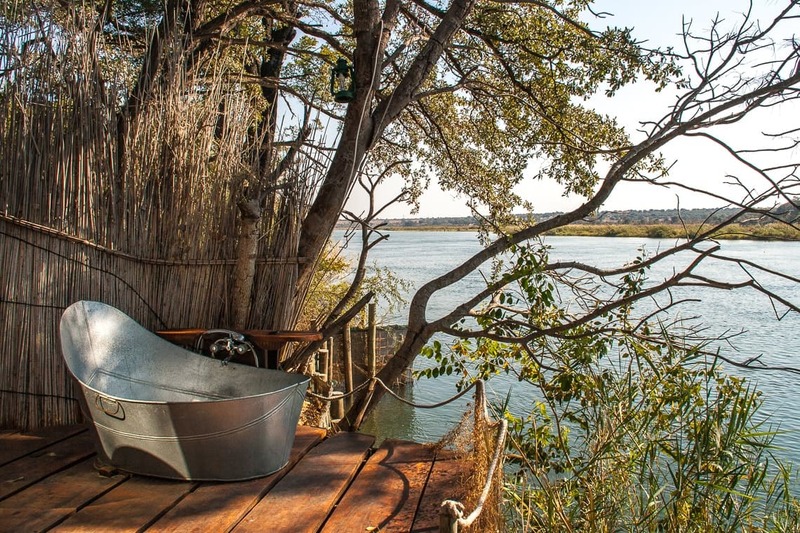 Use the lodge’s vibey bush bar and floating cage pool in the river to keep you safe from crocs while you cool off. Don’t miss a walk around the campsite to read the fun signs and see some of the funky ablutions. Find more about author Roxanne Reid’s African travels on her blog. Planning to visit the country of wide open spaces and starry skies? 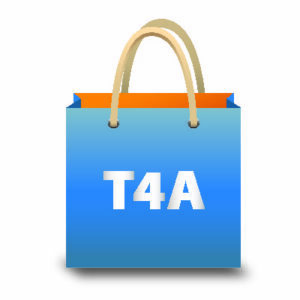 Get all the information you need in T4A’s Namibia Self-Drive Guide. The book contains essential information on overlanding in the country, destination descriptions and more than 800 places to stay.